AirLite— The HEALTHY Choice in Animal Bedding! Looking to reduce ammonia, allergens and a more absorbent animal bedding? Airlite is your answer! Airlite is superior because it is dust free and simply superior to shavings! AirLite— The HEALTHY Choice in Animal Bedding! Airlite America, LLC is the largest manufacturer of cardboard bedding in the country and the only company to use 100% clean and Unused cardboard. There is No cross contamination as we purchase cardboard from the manufacturer. Airlite is superior to other bedding because it has NO dust. It does not break down to dust when trampled on and does not aerosolize as do shavings, pellets or straw. Is It True That Cardboard Is 4 Times As Absorbent as Shavings? Yes! We’ve all seen a horse urinate in their stall over fresh shavings— and lamented that the shavings did nothing to stop the puddling urine (and resulting ammonia smell!) as it runs across the stall floor. What you may not know is that cardboard is 5 times more absorbent then shavings and holds the ammonia out of the atmosphere better than any other bedding. The Canadian Equine Research Council research reports reveal that chopped cardboard bedding is found to be 5 times more absorbent than wood shavings, 6 times more absorbent than straw bedding and 2 times more absorbent than hemp bedding! Can Airlite Really Help My Horse With Allergy or Respiratory Issues? Yes and what a difference the resulting cleaner air can make to your horse! Airlite is a First Line Defense for all non-infectious respiratory issues. When used in stalls and trailers, you can eliminate 50% of the respirable dust in the stall environment. Airlite composts to a pH neutral mulch in 4-6 weeks compared to 8+ months with shavings. Airlite has been documented by several University Studies to be the safest bedding for animals where a dust free environment is desirable. The composition of our new recycled cardboard and manufacturing process of Airlite USA products, make it virtually dust, spore and allergen free. Along with its absorption rate makes it the healthiest alternative to other types of bedding. Results from scientific research show that cardboard bedding is particularly beneficial for animals and humans suffering from allergies or breathing problems. The effect on animals, particularly horses and smaller species, is likely to be even more pronounced especially as they are in close continual contact with their bedding. 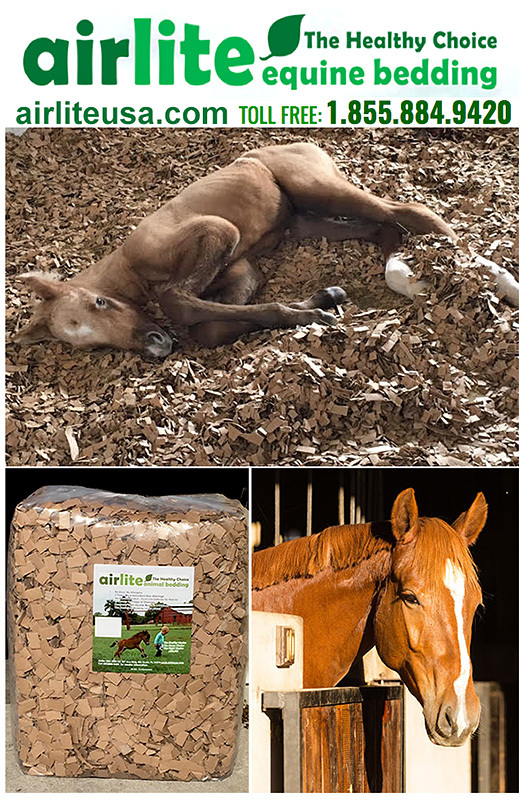 Important Note To Horse Owners: Other cardboard bedding products use recycled cardboard but it is not unused, often containing tape, contaminants, and other inflammatory mediators which they have no control over…Airlite is COMPLETELY unused and contaminant free!! What Does The Journal Of Equine Veterinary Science Say? With particular reference to horses; the Journal of Equine Veterinary Science recommends using unused, recycled cardboard for horse bedding for prevention and treatment of horses with Heaves, IAD, COPD (Chronic Obstructive Pulmonary Disease), breathing problems or allergies. Cardboard bedding is super absorbent, cost effective, light and easy to handle. But Can Airlite REALLY Help My Barn With Ammonia Problems? That is what several University studies say! The high absorbency factor in shredded cardboard bedding helps liquid waste flow quickly down to the floor level where the bottom layers start absorbing immediately. This leaves the surface layer absolutely dry. Cardboard bedding is odorless and can remarkably reduce the amount of ammonia which builds up in stables, barns and any confined animal environment. Chopped cardboard has natural insulation which helps keep animals warm during colder months. It has no food contamination, or cross contamination from oils and chemicals and hence can be safely used for all animals, even newborns, giving them the healthiest start in life. So What Are Some of The Advantages That Airlite Offers Horse Owners? Airlite truly is the HEALTHY choice— and healthy translates to SAVING money, and helping performance. What Other Differences Will I Notice With Airlite Bedding? AirLite bedding will have a slightly darker appearance than traditional wood shavings. It will feel far more cushioned and supportive to the feet and legs and you will notice a distinct lack of dust when opening the bags of bedding and walking on it. AirLite is relatively sterile and does not harbor mites and pollutants common in other bedding materials. 3 inches of Airlite is as cushioning as 6 inches of shavings! Is It True That Professional Facilities Are Looking Into Airlite Bedding? The word about Airlite is spreading! We are getting calls from leading show grounds every week that are interesting in learning more about providing Airlite to their show participants. Airlite will help cut down on allergens, dust and other problems that can plague a show grounds. Make sure YOU have Airlite Bedding for your horses when you travel! So How Does Airlite Compare To Straw? The unique design of the cardboard animal bedding imitates the natural interlocking framework of straw when spread out as bedding and this makes it longer lasting. Cardboard animal bedding is 100% bio-degradable and complete breakdown usually takes between 4-6 weeks when best composting practices are used. Is It True That 1 Bag of Airlite Is 35 Pounds, Compared To Most Shavings Bags That Are 22 Pounds? Yes… 1 bag of Airlite is comparable to 2 bags of wood shavings. Twice the spread and coverage, 4-5 times more absorbent and much more durable, so the useful life is much greater. Airlite does not breakdown to dust, it only gets softer and more absorbent. Use less, Waste less! We Ship Nationwide! Call Today To Locate Or Become A Dealer! We all pay for health for our horses in one way or the other— why not make sure you invest your money into a bedding that can help provide greater respiratory health, comfort and wellbeing? We ship nationwide and have many resellers— we welcome your calls and inquiries into dealerships— or just making sure that YOUR barn has Airlite for the horses you love. Call us today!